Nine super supporters ran for Chin Up in the Great North Run 2018. Our huge thanks go to Lisa, Vickie, Stuart, Ellie, Sean, Jane, Sophia and Elin. 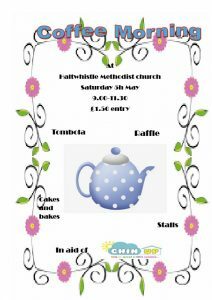 Thanks to all those who came to our coffee morning in Haltwhistle on Saturday, we have raised £320 towards our work this year. Our appreciation must also go to those volunteers who baked, crocheted, ran stalls, sold raffle tickets and took entrance fees. Without them, and the generosity of people patronising our events, Chin Up could not continue. Christmas Coffee Morning Raises £500! 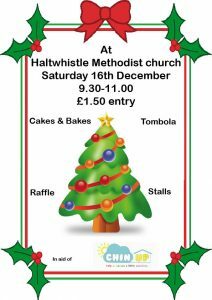 Our last Coffee Morning of 2017 at Haltwhistle Methodist Church Hall raised £500 for our charity. This will help with the costs of the full refurbishment of Jonathan’s House which is currently in progress. Huge thanks to everyone who came to support us.